This bottle was crafted to hold a great artisan cachaça I brought from my last trip to Brazil. This cachaça was crafted by the owner of a small restaurant at Costa da Lagoa in Floripa and he gave it to me as a keepsake of our lunch after the trekking that got us there. As he didn’t have any bottle he gave it to me in some anonymous plastic water bottle and I thought it deserved some better packaging. 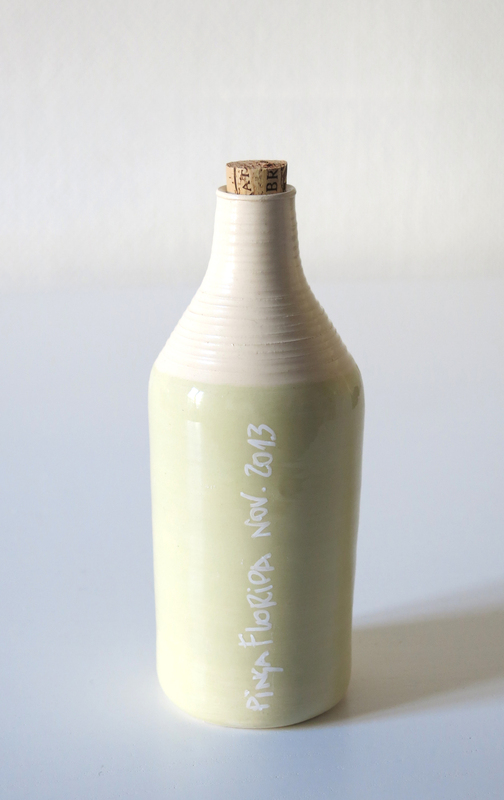 This bottle was wheel thrown in earthenware and colored with a yellow slip. I’ve made a striped texture on the top and closed it with reused wine cork. To label I used a white chalk pen.